Defence Science and Technology is proud to release Fire Across the Desert: Woomera and the Anglo-Australian Joint Project 1946–1980 in a new digital format. Written by Peter Morton and first published in 1989, the 600 page history book is now accessible to a wider audience in multiple digital formats with the release of PDF (screen and high quality print), ePub and Kindle formats. 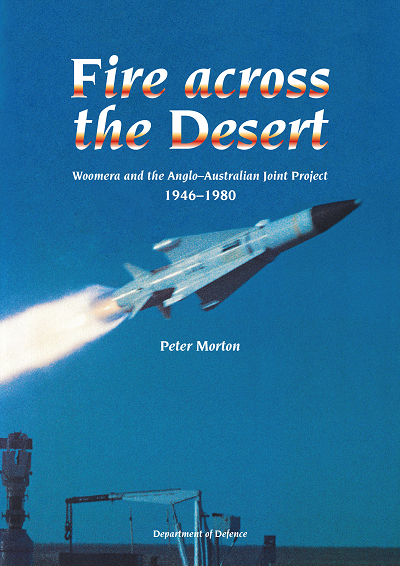 Fire Across the Desert is an extensive account of the Joint Anglo Australian Project that led to establishment of the township Woomera and the missile testing range that helped shape our defence and contributed significantly to space exploration. Fire Across the Desert has been digitised to coincide with the 50th Anniversary of the launch of Australia’s first satellite, WRESAT, from the Woomera Rocket Range on 29 November 1967.